Heat a skillet to medium high heat. Saute the Onion and garlic. Add the ground Pork, once the pork is browned add the salt and pepper, water chestnuts, and carrots, continue cooking and stirring until all ingredients are combines. Removed from heat before added vegetables become too soft. and add 2 Tablespoons of the filling mixture to the bottom of the wrapper, and begin rolling, keeping the mixture tight at the bottom and folding in the side corner as you roll. Use the lightly beaten egg to seal and close the lumpia. Repeat the process until all the mixture and wrappers are filled and used up. Heat your oil to 350 degrees and once hot, place the lumpia into the oil (in small batches depending on the size of your oil pan). 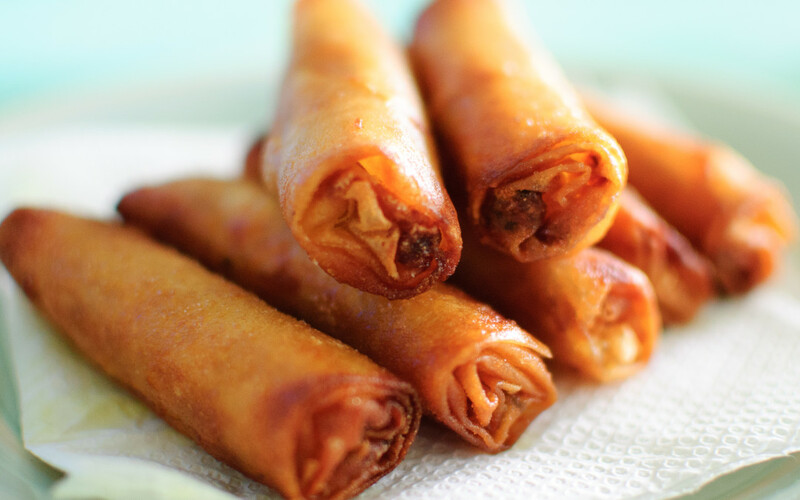 Once the outside wrapper is brown, the lumpia is done, remove for oil onto paper towels to drain, and serve warm, with sweet chili dipping sauce.